When I was studying in POLBAN (Politeknik Negeri Bandung), there was an essay writing subject. It was fun though. First of all, I was thought to write a paragraph with simple topic. So, I would like to share a few of the exercise. Focus : My little brother, Irgi. The most important people in our life are our families, of course. Father, mother, sister(s) and brother(s) are the member of the family. I have one sister and two brothers in my family and I am the first daughter. My brothers are Rizal M Ridzuan as the eldest and M Irsyad Ghiffari as the youngest. 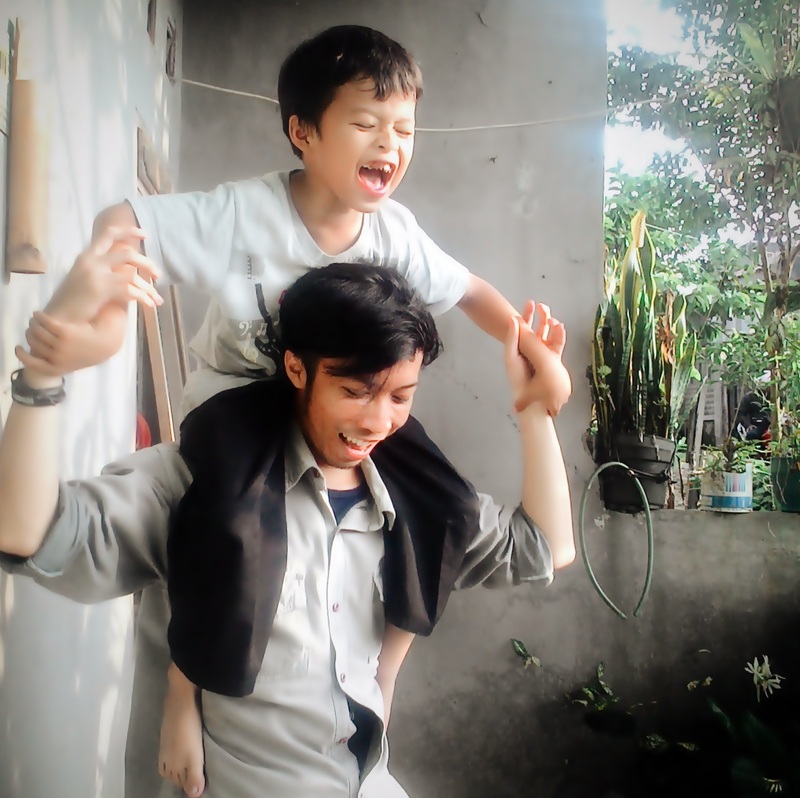 My little brother, Irsyad, in my family has the nickname. We usually call him Irgi. He is five years old, but he does not go to kindergarten yet. He really likes cars and we as his family love him so much. We want to him to grow up well and we are trying to, because that is family do. Everyone gets stress in their life. However, it can be controlled. Try to reach something logically, because if you want to reach something that in fact you cannot reach it, you will get highly pressure and get stress. Furthermore, you have to enjoy your hobbies and your activities so you do not think about things that make you stress. Having a good relationship also can decrease your stress, because having a good is having a good relationship with others. So, people surely get stress and it cannot be avoided but we have to know how to control it so that we still enjoy life with happiness around us. "Cigarettes are a classy way to commit suicide." These are the words from Kurt Vonnegut who thinks that smoking is very useless. People who smoke are wishing for death. This is a very miserable thing to know that many people have to be reminded of its detriment. Smoking is detrimental because it costs money, creates pollution and results in medical problems. In Kawanku magazine no.25, Natalie Portman said "I don't really care if it ruins my career. I would rather be smart and active than a movie star." A woman like Natalie Portman has passion in her heart to bring her country up. She prefers working in politics using her knowledge than acting in a movie. Based on how she behave, she proves something about women. Women who enter politics are usually socially conscious, extraordinarily bright, and self-directed. On 20th February 2013 in ABC news, the girl was pregnant when she was 16 years old. Her parents told her to do abortion, because the girl was dying before she delivered the baby. However, the girl won abortion battle. She delivered the baby and saved it from the parents' suggestion for abortion. Still, this abortion thing becomes a consideration of a legal thing. Coming to a decision about the abortion issue includes legal, physical, and mental considerations. Using Contrast to the thesis statement. Family is the closest people with us. Even when our family must stay in hospital, we shall take care of them and make them happy. Furthermore, our relationship also increase. We can increase our relationship with the by spending our time with them in hospital. However, having a family member in hospital can be stressful, expensive and frightening. Your mom is surely a great woman :). It is an honour that I can make you remember her through my writing. Thank you. Yea, surely.. Long time ago while everything was fine.. Now, my mother is too old to go to work. She encounter the sudden ill frequently. She's alone at home now, without the existence of her son to treat her. I am sorry to hear that, you must miss your mom. Why don't you visit her? No, I don't have much time to visit her.. May be next holiday, new year perhaps... How's your family? they're fine, aren't they?